This years exhibit at Ripley’s Aquarium features the wonders of the Amazon! The Amazon River, which moves over 4 million cubic feet of water per second, is filled with Piranhas, stingrays, armored catfish and lots of other exotic freshwater species. See them at Rio Amazon for yourself! 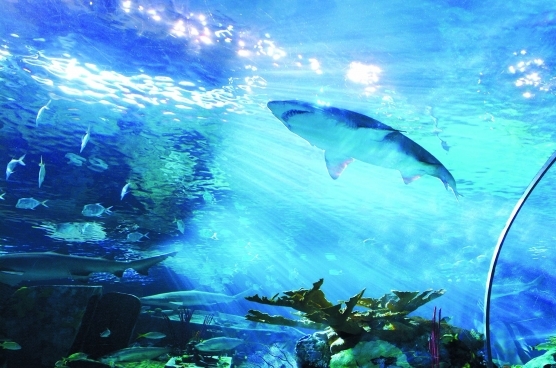 Leisurely travel the Dangerous Reef on a moving 340-foot long glidepath, as you wind your way through the acrylic tunnel and come face to face with snappers, tarpons, grunts, squirrelfish, a green sea turtle, giant stingrays, sawfish and…very large SHARKS! A collection of delicate undersea life such as Pacific Giant Octopus, sea anemones, living corals, jellies and weedy sea dragons are featured as art in The Living Gallery. The bright colors of the rainbow are found underwater in the Indo-Pacific coral reef. View thousands of intricately colored fishes from the tropical islands of the Pacific Ocean as they swim around and through the delicate reef structure in the Rainbow Rock. Gliding through the water like majestic birds in the air, the rays on display in Ray Bay are gentle, affectionate creatures. Related to sharks, rays are fish without bones. Instead their flexible bodies are made of cartilage.